Anew system for workplace wiping has been launched by Tork manufacturer SCA Tissue Europe. 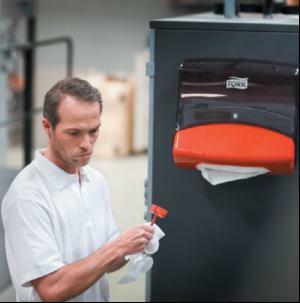 Tork Performance comprises a state-of-the-art collection of dispensers that have been engineered to function at a high level with Tork wipers, providing a cohesive system for the workshop, food service and healthcare environments. The range comprises floorstands, centrefeeds and wall-mounted dispensers in two colour options. They have been designed to improve workflow and reduce costs by saving maintenance time and reducing waste and over-consumption.Wallmounted units and centrefeed dispensers have side-opening panels for easy loading. They can be opened either via a push-button or key, while tight external seals protect the wipers from splashes and contamination. The top-of-the-range W4 wallmounted dispenser holds up to 300 clean-cut wipers to minimise time spent reloading and presents them one at a time. The strong plastic casing protects the wipers from contamination before use, and builtin 'gutters' prevent water from entering the unit.